Emails remain one of the most effective ways for companies to engage with their clients. So how to stand out among all those newsletters and special offer emails? Email marketing continues to be one of the most widely used lead generation strategies for online businesses. More and more companies choose emails to engage prospects, re-engage passive customers, and deepen relationships with target audiences while learning how to serve them better. No wonder that the total number of consumer and business-related emails sent and received per day this year is about 281 billion, according to the Email Statistics report by Radicati Group. This number will grow to 333 billion daily business emails, predicts the same report, so chances are high that email marketing will continue to develop at the speed of light. Unsurprisingly, your target audience members’ email inboxes are cluttered with promotional emails, newsletters, and other messages. With the total email volume consistently growing, the inboxes will continue to overflow with messages from your competitors, which affects a long-term subscriber engagement. Clearly, to engage as many prospects and customers as possible, your emails have to stand out in a cluttered email inbox. To help you with that, we’ve compiled a list of strategies that can attract their attention and entice them to open your messages. Implementing these proven strategies becomes increasingly important for online businesses to stand out from the pack and make their voice heard. Let’s make sure that the same is true for your own business. The importance of a well-crafted subject line cannot be overstated because it’s the first thing and often the only one, too – that a recipient sees when browsing an inbox. 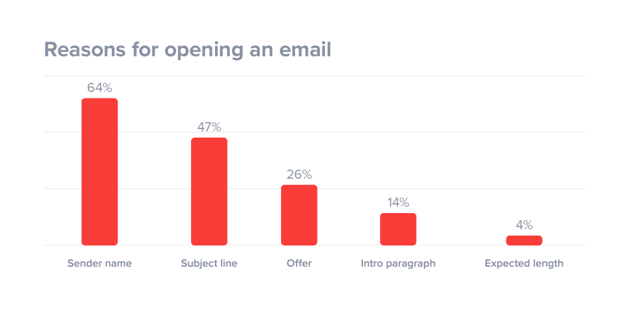 Unsurprisingly, a subject line is one of the main reasons why people open an email. For example, 47 percent of email recipients say they’re likely to read a message based on its subject line, according to Super Office. So what are the best subject line practices that give you the highest chance of getting a good open rate? First, include the name of the recipient. Doing so increases the number of opened emails, according to the aforementioned report by Super Office. Second, let the recipient know that the email is worth opening by describing the benefits to them. Here are a couple of examples of subject lines describing benefits recipients. The first one below promises that the recipient can improve their support team’s troubleshooting skills. The second one describes that the recipient can get a good deal if he or she opens the email and buys something to get 10 percent off and free shipping. Third, you can create a sense of urgency to entice the recipient to open an email and take advantage of a good offer. Here’s a good example of a brand using a specific timeframe in the subject line to increase the open rate. Fourth, you can include an emoji in the subject line to maximize the chance that your emails will stand out in a cluttered inbox. Here’s how McDonald’s does it. By ‘strong email body,’ we mean a reader-centered content that delivers on the promise given in a subject line. Creating such content is a must because after opening your message, the recipient will be looking for something that can benefit them, so if they don’t discover anything they like, they’ll remember about it and send your next email straight into the spam folder. Here’s the list of the most important recommendations that your email body has to follow to ensure a maximum click-through rate. Be short and sweet. Get to the point as quickly as possible because many of your recipients won’t appreciate reading lengthy texts. Show your respect by cutting through the clutter and clearly describing why you’ve sent that email. Establish relevancy of the email by identifying the benefits to the user. Write in the second person and use the pronouns “you,” your,” and “yours.” Avoid corporate and hard sell language. Include social media buttons to make it easy for recipients to connect with you on social media. 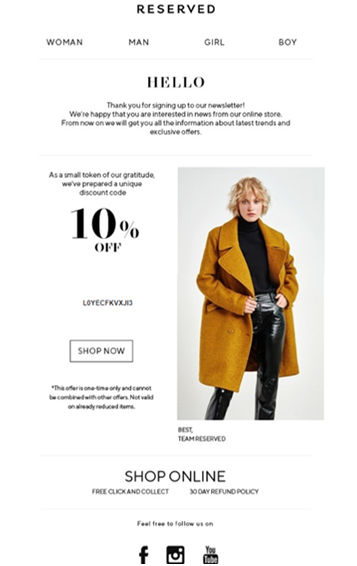 Here’s an email from a clothing brand Reserved that follows these recommendations. Include a call-to-action (CTA) button that stands out from the rest of the email and uses actionable language to encourage the recipient to click on it. 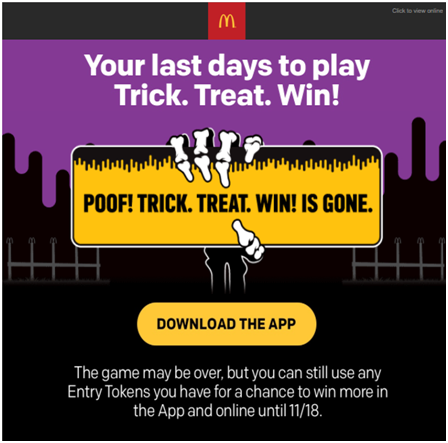 Here’s an example of an email from McDonald’s that has a CTA (Download the App”) that clearly stands out from the rest; besides, the design of the message focuses the attention of the viewer on the CTA. Marketing studies have found that emails sent at specific times get a higher open and click-through rate. 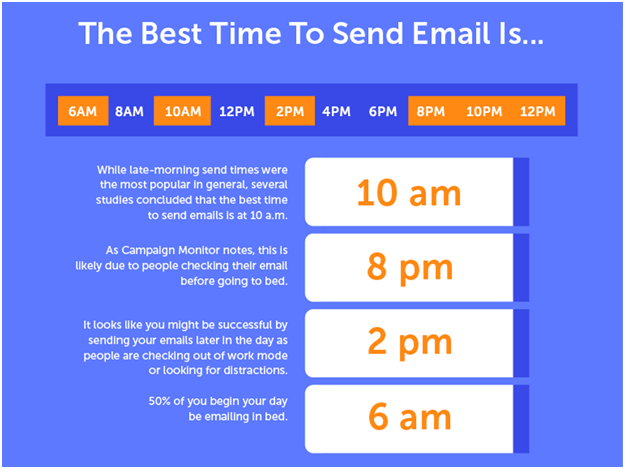 For example, according to the review of 14 data-driven studies by Coschedule, the best time to send marketing email is Wednesday. Wednesday was found to be the best day but Thursday was another worthy day for businesses that send two emails a week. In terms of the time, CoSchedule also provided some specific recommendations for business. It’s also worth noting that while these days and times worked great for others, the best time to send emails depends on your unique target audience and business. So, try testing different times and dates to define the ones that produce the highest open and click-through rate, which is quite simple if you’re using an email marketing software. The inboxes of your customers are cluttered, and you can’t do anything about it. However, you can make your own emails more attractive by using the tips described in this article and make them stand out in the sea of other emails. I hope that this article gave you the knowledge you need to build a strong foundation for email lead nurturing. And remember, the customer is the center of your universe right now, so make every email interesting for your target audience, and your email marketing will perform great. Ryan is a writer and passionate blogger. He likes sharing his thoughts and tricks with the readers. Currently he works as the real estate agent at Flatfy. Feel free to contact him on Twitter!